There's nothing more uncomfortable than seeing someone's romantic hopes brutally dashed in public. 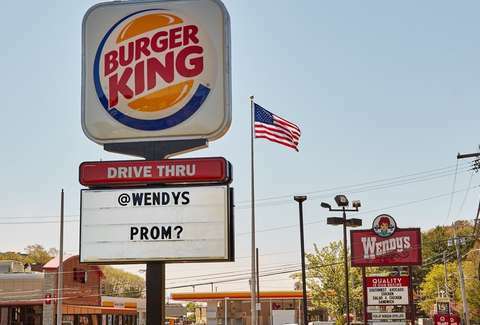 However, you have to hand it to anyone willing to risk rejection on such a grand scale in the first place, like a Burger King location in Lynn, Massachusetts did this week, when it asked the Wendy's next door to prom via a message on its outdoor sign. This very public promposal from one fast food burger chain to another was spotted by passersby in town, some of whom snapped photos and posted them online. Eventually, the official Burger King Twitter account caught wind of it, and upped the stakes on the whole saga on Wednesday by tweeting out a photo of the sign and tagging Wendy's. It was a bold move that could have ended very, very badly for Burger King, considering Wendy's long and storied history of roasting fellow brands and regular people on social media. In this instance, however, the pig-tailed fast food chain held back its savagery and delivered a perfectly cutting yet chummy response. They said yes! The terse acceptance from Wendy's got a lot of people talking and gave the brand another excuse to unleash its signature sass at the expense of McDonald's. As for demanding Burger King not get handsy, can you blame them? Who would want that creepy King's mitts near them? Well played, BK and Wendy's. 'Round of applause all around.